Ferrari have tested the 'halo' cockpit head-protection device that will be introduced into Formula 1 in 2017. Kimi Raikkonen drove with it for two laps on Thursday, at the final pre-season test in Barcelona. The design is a prototype based on one agreed by all the teams and F1's governing body after years of research. However, it is not necessarily the definitive design that will be used next year as further testing still needs to be carried out. The device is being introduced to protect drivers from flying debris following a series of deaths and injuries across motorsport. It has the support of the F1 drivers, although a small minority say they would prefer to leave cockpits completely open. "My opinion is it's really a massive step in safety," said Mercedes' Nico Rosberg. "Most fatalities in the last years this would have saved those people, the large majority. So it is huge step and I think it's definitely needed. "OK, visually you can say it is not quite as good as now but from some angles I saw it, like from the front, it looked pretty cool. So I am sure with a bit of thinking about it it will look cool eventually." The 'halo' emerged as the best solution after various devices were tested. 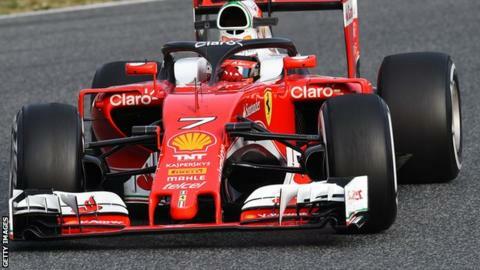 Observers expressed concerns the design would affect visibility, but top-level sources have told BBC Sport that this is not the case. The driver's eye-line is below the main body of the structure, while the central support strut at the front effectively disappears from view because of a human's binocular vision. However, there is some concern that it might impede the view of the starting lights in certain circumstances. According to Ferrari, Raikkonen, world champion in 2007, said the visibility was "OK" following Thursday's run-out. Red Bull are proposing a different solution, what one source described as a "half canopy", although one senior insider told BBC Sport that the design "doesn't look very promising". Team boss Christian Horner has told motorsport.com that they plan to run it on a show car next month.